People in the gym get inspired by exercises that movie stars use to get a “superhero” physique. And more female superheroes in cinema now inspire more women to try free weights in the gym. I was skeptical about this – could resistance training benefit me, if I didn’t want a bulky physique? So I began measuring my workouts: after all, if you can’t measure it, you can’t improve it. 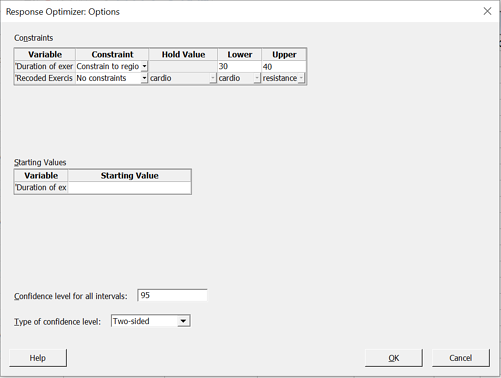 Here is how I analyzed my fitness tracker’s data in Minitab to find the answer. There has been a growing popularity of strength and resistance training among women. Most of the attendants at pump classes (exercise classes using weight plates and barbells) in gyms are female. You heard about celebrities picking up strength training to get that “superhero” physique for movie roles. You see more women lifting free weights in the gym. I go to the gym regularly and have always been keen on doing cardio exercises such as cross-trainer, walking or treadmill. I was skeptical of strength and resistance training as I believed this type of exercise would turn my physique bulky, like a body builder. As a non-believer, I started doing my own research and embarked on the journey of learning about resistance training and weight-lifting. I started with at home exercises using small dumbbells, followed by pump classes at the gym. To “up the game,” I started personal sessions with a trainer at my local gym focusing on resistance training. The course finished on a high note with me doing deadlift (now my favorite workout) in front of the squat rack. While cardio exercises help to train your cardiovascular (heart and lungs) system, resistance or weights training helps to build muscles and maintain your bone density. Imagine a factory with furnaces. The more furnaces there are, the more energy required to run the factory. The same principle applies to building more muscles to the body. Another side-effect of this is better body definition and shape which I have been struggling to obtain in the past by purely doing cardio exercises. Having gathered data using my fitness watch for the last two years, I used Minitab to analyze a subset of the data to determine if adding resistance training has made an impact on my daily calories burnt. Here is a view of some of the data. 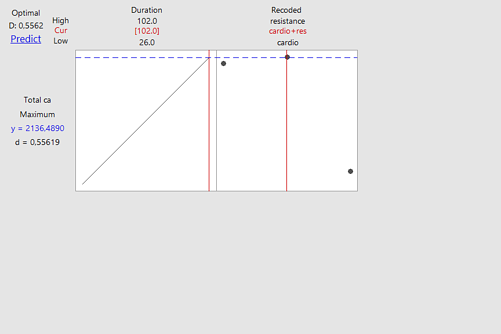 Columns indicate the type of exercise done, the calories burnt from the session and the total duration of the exercise session recorded to nearest minutes. Enclosed are details about the total calories burnt on a particular day. I do a mixture of routines across the week, with the weekend as rest days. Certain days, I do purely cardio exercise such as running, belly dancing class or spin class. On some days I do purely resistance training such as personal training sessions, pump class or yoga. On some occasions, I combine cardio and weights exercises, e.g. 25 minutes doing free weights and 15 minutes on treadmill. As seen from the data above, cardio workout does burn more calories during the session compared to resistance workout. However, with resistance training, the magic happens after the exercise when your body starts to repair and build muscles. It gets your metabolic rate running on a higher level for a longer period of time. This is also part of the side-effects of delayed onset muscle soreness. There is definitely basis for the saying “No pain no gain”. The days that I have lifted weights, my calories count would exceed 2000 by bedtime. For sessions including cardio and resistance exercises, the longer the session, the more calories burnt. For example, the 90-minutes long hot yoga class or the long running session are both calorie burners. But it’s not always possible to spend such long period of time doing exercise. What’s more interesting is when I add resistance training to my cardio workout into a shorter dual session, the calorie consumption definitely increases. How significant is this? Let me use Minitab Statistical Software to find out. Cardio vs Resistance or Cardio + Resistance? 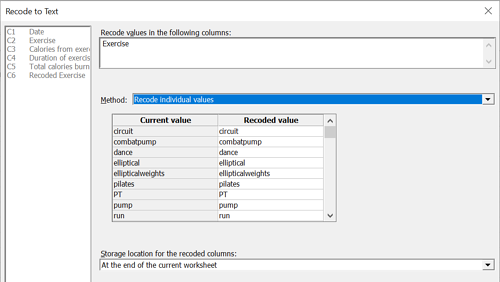 First of all, I am going to recode the Data to Text to create a column that categorizes the exercise type. I will split the exercises into 3 groups: cardio, resistance and cardio + resistance. Let’s look at some basic statistics of the three types of workout in terms of calories burnt during the session and calories burnt for the day. Purely cardio workout burnt more calories during the session on average. However, looking at the total calories burnt for the day, there is not much difference between pure cardio or cardio and resistance sessions. To investigate this further, I am going to use GLM (general linear model) under Stat > ANOVA > General Linear Model. 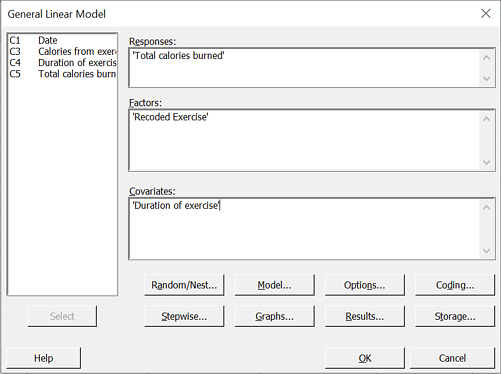 This modelling method allows us to consider a continuous response, categorical factors and covariates together. In my case, I will use the recoded exercise type as the factor and the duration of the workout as the covariate. 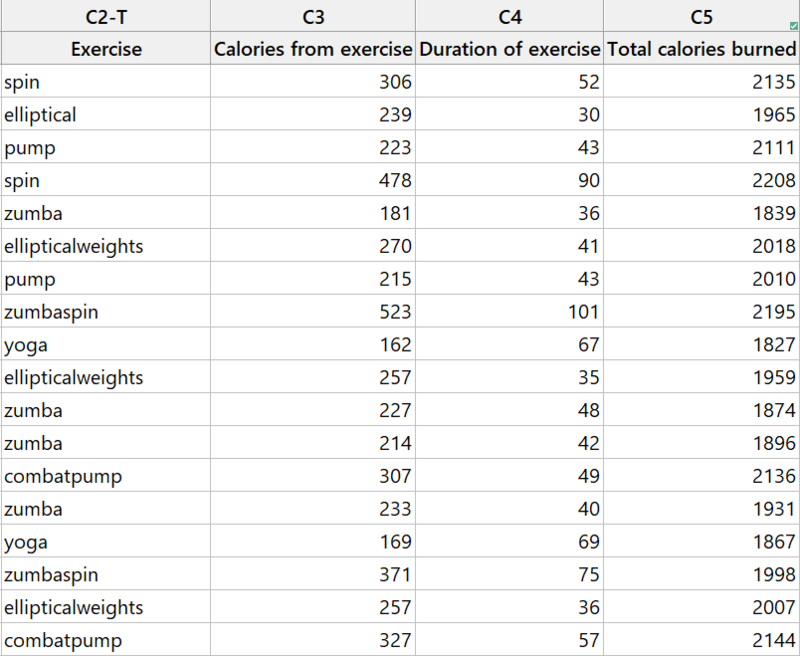 Results in the Minitab output below indicate that both ‘duration of the exercise’ and ‘type’ have an impact on the total calories burnt as seen by the low p-values. And I have the following equations for each type of exercise. The type of exercise is proven statistically significant. However, this only tells us some groups are different rather than which group is significantly different compare to which group. To qualify this, we can use Stat > ANOVA > General Linear Model > Comparisons. The results are then as follows. It shows that there is a significant difference between doing a pure weights exercise to performing a combination of weights and cardio. While the difference between doing cardio and cardio with weights is not significant. 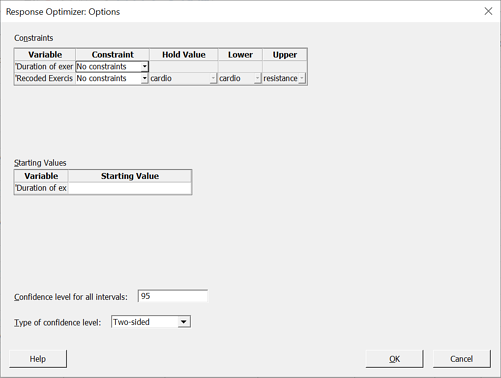 What follows is hence finding out optimal settings in terms of exercise type and duration to achieve the best results using the response optimizer function in Minitab Statistical Software. The latest version of Minitab is able to handle covariates in the response optimizer in General Linear Models (GLM). Using the default settings, I obtain the following. The optimizer suggests a mixed cardio and resistance session of 102 minutes. This duration is not realistic. Let me set a constraint to the time period to between 30 to 40 minutes. I have also tried putting constraints on the type of exercise as shown below. Again the same optimal solution is obtained. While the pairwise comparison indicates the difference between doing purely cardio and cardio with weights is not significant, the optimizer shows that doing this type of mixed session improves efficiently as you require less time to achieve the same goal. Minitab has enabled me to make smart decision on my exercise routine and find the solution that works best for me. And it’s fantastic that this analysis justified the decision to adding resistance training to my routine. It’s a long journey to get that “Amazon warrior” physique that I’ve been dreaming of but at least I know I am using the right approach. Well, it’s time for my protein shake! 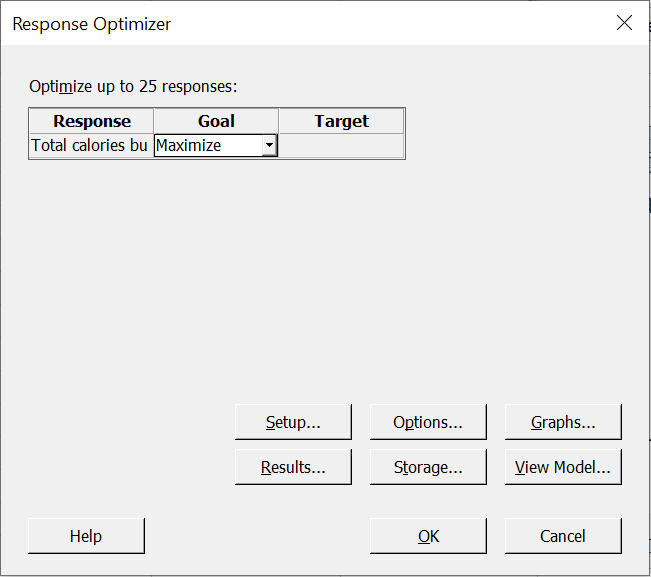 This article relates to the use of the Minitab’s Response Optimizer process improvement tool in a real life example. 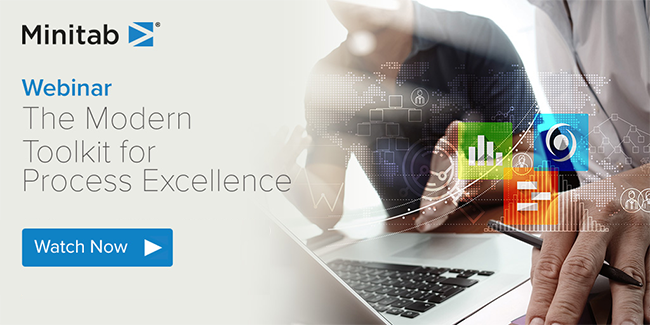 Watch our Modern Toolkit for Process Excellence Webinar recording to see how other analytical and lean tools can be used for solving a real-world challenge.